This meter building was part of the Iowa – Segment 1 pipeline contract awarded to S.J. Louis Construction of Waite Park, MN in January 2007 and reached substantial completion in September 2007. For more information on this project see Iowa – Segment 1 under the Treated Water Pipeline link. The contract for these two meter buildings was awarded to Gridor Construction of Buffalo, MN in February 2008 and substantial completion was reached in September 2008. Final construction cost was $593,000. The contract for these four meter buildings was awarded to Hoogendoorn Construction of Canton, SD in September 2010 and the last meter building reached substantial completion in January 2012. Final construction cost was $1.8 million. The meter buildings for Minnehaha Community Water Corporation (MCWC) and South Lincoln RWS also included pumps. MCWC’s meter building is just west of Sioux Falls and is the first of three connection points for them. South Lincoln RWS’s meter building is just over a mile northeast of Lennox, SD. Rock Rapids entered into an agreement with Lyon-Sioux RWS and Grand Falls Casino northwest of Larchwood, IA to serve water to the casino and a large part of Lyon-Sioux RWS’s service area. The casino is on the other side of the road from Lewis & Clark’s pipeline. This involved the casino constructing a meter building and paying 100% of the engineering and construction costs for the building and the short stretch of pipe. Construction started in the spring of 2011 and was completed by that fall. The building itself is owned and operated by the casino but Lewis & Clark owns and operates the piping and equipment inside needed to deliver and meter the water. Lewis & Clark sells water to Rock Rapids, who in turn sells water to Lyon-Sioux RWS, who in turn sells it to the casino and other members of their system. The contract for these three meter buildings was awarded to Hoogendoorn Construction of Canton, SD in May 2011 and the last meter building reached substantial completion in April 2012. Final construction cost was $2.1 million. The meter building for Sioux Falls is along Benson Road, northwest of city limits at the end of SD-Segment 4. This is one of two connection points for Sioux Falls, although the City is considering adding a third connection. The Beresford and Parker meter buildings also included pumps. More pumps will be added at Beresford in the future when the pipeline reaches Sioux Center. The 85th Street Water Tower also serves as a joint metering facility for Lincoln County RWS and Sioux Falls. The contract was awarded to Landmark Structures of Ft. Worth, TX in July 2009 and substantial completion was reached in April 2012. For more information on this project see the 85th Street Water Tower under the Storage link. 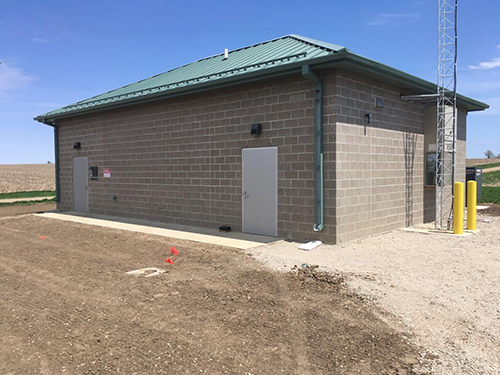 The contract for this meter building was awarded to D.W. Proehl Construction of Sioux Falls, SD in August 2014 and substantial completion was reached in May 2015. Final construction cost was $838,000. This facility is a joint connection point for Rock Rapids and Rock County RWD at Dove Avenue on the Iowa side of the Iowa/Minnesota border. It also included two pumps. Three more pumps were added at a later date. Beresford and South Lincoln RWS entered into a partnership to serve water to a large scale dairy 10 miles northwest of Beresford, which required constructing a meter building 50 feet from the main trunk line along 467th Avenue. The dairy paid 100% of the construction and engineering costs, but the meter building and piping is owned and operated by Lewis & Clark. Time was of the essence so rather than going out to bids, Beresford and South Lincoln RWS negotiated a contract with Hoogendoorn Construction of Canton, SD. Substantial completion was reached in April 2015. Lewis & Clark is selling water to Beresford, who in turn is selling the water to South Lincoln RWS, who in turn is selling the water to the dairy. The contract for these two meter buildings was awarded to Robert L. Carr Construction of Marshall, MN in May 2015 and the last meter building reached substantial completion August 2016. Final construction cost was $1.1 million. Magnolia is a joint metering facility for Rock County RWD and Lincoln Pipestone RWS. The authorized project just included a connection for Rock County RWD. Lincoln Pipestone RWS paid 100% of the construction and engineering expenses to make this a joint connection point. The contract for these two facilities was awarded to Gridor Construction of Buffalo, MN in March 2016 and substantial completion was reached in January 2017. Final construction cost was $1.5 million. The Crooks meter building, just outside of Crooks SD, was originally planned to just pump water to Madison. Minnehaha Community Water Corporation (MCWC) paid 100% of the construction and engineering costs to also make this another connection for them. The MCWC portion includes three pumps and is the second of three connection points for MCWC. The Madison pumps will be installed at a later date when the Madison service line is complete. A contract for a mainline booster pump station and meter building was awarded to Gridor Construction of Buffalo, MN in September 2016. The meter building reached substantial completion on March 4, 2018 and the pump station reached substantial completion on May 2, 2018. Final construction cost was $3.7 million. The pump station is about five miles south of Luverne, MN and the meter building, which is a second connection point for Lincoln Pipestone RWS and includes pumps, is a few miles east of Adrian, MN. This contract also included adding two more pumps to the joint Rock Rapids/Rock County RWD meter building/pump station on the IA side of the IA/MN border. A contract for these two meter buildings was awarded to KHC Construction of Marshall, MN in August 2017. Substantial completion was reached on the Worthington meter building in October 2018 and the MCWC-East meter building in November 2018. Final completion has not yet been reached, but Lewis & Clark’s cost is expected to be around $1.7 million. The MCWC-East meter building along Six Mile Road southeast of Sioux Falls provides Minnehaha Community Water Corp with their third and final connection.